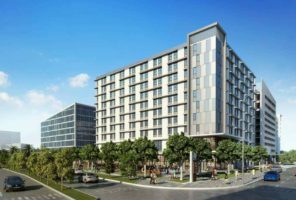 When complete in March 2018, Aloft Hotel at Aventura Park Square will stand 10 stories tall and include 207 spacious rooms with a cutting-edge design. To compliment this upscale project, features will include the chic W XYZ Bar, Re:mix Lounge, Re:charge Fitness Center, lobby computer work stations, meeting room and splash outdoor heated pool with oversized pool deck. The structure is supported by 228 auger cast compression piles 16” in diameter and 48’ in length, consists of cast-in-place concrete, post tension decks, masonry block with filled cells, single ply TPO roof and PTAC Mechanical System. Features painted stucco with vibrant accents, Prodema Wood Panels, full height fixed impact windows and storefronts and fixed decorative architectural louvers at PTAC units. As construction manager, Craft provided several months of preconstruction consulting services which resulted in $454,000 of accepted cost savings. Limited access and simultaneous construction projects require extensive coordination and sequencing to ensure construction activities are uninterrupted and schedule is maintained.